Every 4-5 yrs I run this FbF because it has so much to teach us about the demands of surface combat - even today. As you read, pay attention to the actions taken from bluff or misinterpretation of unfolding events. Pay attention to the amount of ordnance sent downrange by both sides and the incredible acts of damage control. By 0840 the Americans were in battle formation: a single column still heading north led by Bailey followed by Coghlan, then Richmond, Salt Lake City, Dale and finally, Monaghan when Maya and then Nachi opened fire at a range of 20,000 yards. 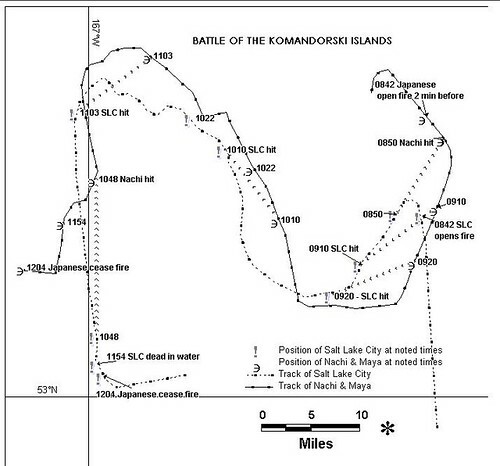 Maya obtained a straddle on Richmond with her second salvo, but then both cruisers switched fire to Salt Lake City. Salt Lake City began shooting back two minutes later. The Americans believed they scored a quick hit on Nachi with Salt Lake City’s third and fourth salvos, but they were apparently observing blast damage on Maya. Her action report stated that her opening salvos set her No. 1 floatplane ablaze. Damage control dumped the plane overboard and quickly controlled the fire. 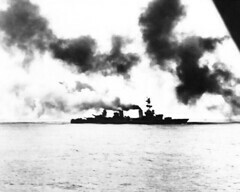 At 0844, as the range continued to rapidly close, Nachi launched eight torpedoes. Apparently these came close to doing serious harm: lookouts aboard Richmond saw a torpedo pass under her bow while one broke surface near Bailey’s starboard quarter. At the time these reports were discounted because the Americans still had no appreciation of the Japanese Long Lance torpedoes’ range. At 0845 McMorris finally changed course as the range was closing rapidly, turning to port, and increasing speed to 28 knots. 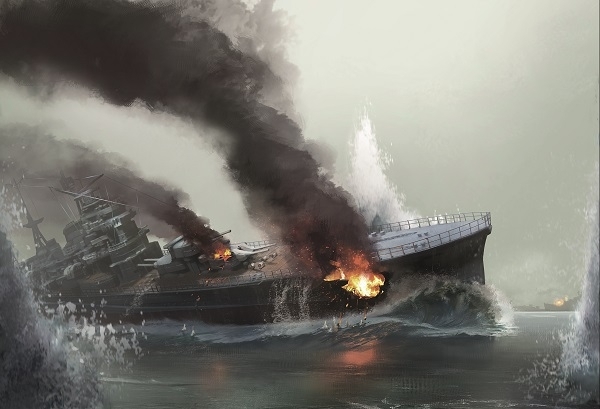 As the Americans settled on a southwesterly course, Salt Lake City continued firing with her rear turrets and drew first blood hitting Nachi at 0850 with her sixteenth salvo from approximately 16,000 yards. 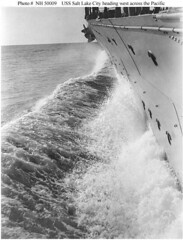 One 8” shell struck the aft section of the compass bridge, killing eleven and wounding twenty-one and damaging the gunnery control electrical circuit. The second shell damaged one of the mainmast’s struts. Two minutes later a third 8” shell struck Nachi’s aft aircraft deck, killing two and wounding five in the torpedo room below. Damage control attempted to shift the affected generator to a boiler with low steam pressure. This error resulted in a complete failure in all power to Nachi’s main battery turrets, freezing her guns at full elevation and leaving them unable to train. She was effectively out of the battle for a half-hour while power was restored.